Mr. Obama, in his White House speech and again to troops at MacDill Air Force Base in Tampa, Fla., ruled it [American combat ground forces] out. Gen. Martin E. Dempsey, the chairman of the Joint Chiefs of Staff, warned that if airstrikes failed to vanquish the militants, he would recommend it to the president. The White House has tried to square these two statements by offering an extremely narrow definition of combat: American advisers could be sent to the front lines alongside Iraqi and Kurdish troops, and could even call in airstrikes, without directly engaging the enemy. It is a definition rejected by virtually every military expert. The American advisers are armed, and if they are shot at by the enemy, they are authorized to return fire. In a close combat advisory role in a city, experts said, the American troops would tell Iraqi commanders which house to hit, how much ammunition to use in an assault, and how to organize medical evacuation for their troops. It is not the first time the United States has gotten tangled in semantics on this issue. In late 2008, before Mr. Obama was inaugurated, the Pentagon adopted a similarly narrow definition of combat to claim it was meeting a deadline for withdrawing combat troops from Iraqi cities by mid-2009. Then as now, it left behind hundreds of American trainers and advisers, who were helping Iraqis press the war effort. Filed in Uncategorized | Tagged war on terror | Comments Off on Never forget. “The analogy we use around here sometimes and is accurate is if a JV team puts on Laker uniforms, that doesn’t make them Kobe Bryant.” — President Barack Obama on the Islamic State in Iraq and Syria (ISIS), in January. (It’s Lakers, by the way, Mr. President, not Laker). “They are an imminent threat to every interest we have, whether it’s in Iraq or anywhere else. They are beyond just a terrorist group. They marry ideology, a sophistication of … military prowess. They are tremendously well-funded. This is beyond anything we’ve seen.” — Defense Sec. Chuck Hagel on the Islamic State in Iraq and Syria, August 21, 2014. Beyond. Anything. We’ve. Seen… their words. My, how things change over a summer. Suddenly, ISIS is a top priority for an administration caught with its pants around its ankles and its golf balls in the drink. There is indeed a JV team, but unfortunately it occupies residency in the White House. What’s really changed since January? Yes, there’s been a slew of towns falling into the hands of barbarians in Iraq and Syria, and the genocide of entire villages of Christians and Yazidis, complete with putting the heads of children on stakes, and now the beheading of an American journalist. But ISIS is the same threat today that it was eight months ago. They’re the same extremist thugs. The same wacko philosophy. This is a terrorist group (an army really at this point, controlling 35,000 square miles of territory) that is so brutal that even al-Qaeda had distanced itself from them, and that’s saying something! Nothing has changed. No, the difference is that even to their typical media defenders and lap dogs the Obama camp has been exposed as a group of absolute foreign policy clowns. They are naive and inexperienced. Their actions, or rather lack thereof, have been indefensible. All the previous criticism regarding their childishly utopian foreign policy ideals, complete with nonsensical “reset” buttons, has come true. Did that “reset” button help the Ukraine? Has the past Obama Middle East apology tours paid any dividends in Libya, Syria, Iraq, or Gaza? Even his once Secretary of State, Hillary Clinton, criticized the president, saying, “Great nations need organizing principles, and ‘don’t do stupid stuff’ is not an organizing principle.” Yes, yes, Mrs. Clinton is clearly doubling back on principle in a way that would make even Charlie Crist blush, and she’s obviously doing this for a run at the presidency. But that doesn’t make her statement inaccurate. She’s right (too bad she didn’t actually mean it). Filed in Politics | Tagged appeasement, counterterrorism philosophy, intel failures, iraq, Middle East peace, war on terror | Comments Off on Who’s the JV team, Mr. President? An awesome piece on moral clarity in the Middle East, by Charles Krauthammer. The whole idea was to establish the model for two states living peacefully and productively side by side. No one seems to remember that, simultaneous with the Gaza withdrawal, Israel dismantled four smaller settlements in the northern West Bank as a clear signal of Israel’s desire to leave the West Bank as well and thus achieve an amicable two-state solution. It makes no sense. Unless you understand, as Tuesday’s Post editorial explained, that the whole point is to draw Israeli counterfire. To deliberately wage war so that your own people can be telegenically killed is indeed moral and tactical insanity. But it rests on a very rational premise: Given the Orwellian state of the world’s treatment of Israel (see: the U.N.’s grotesque Human Rights Council), fueled by a mix of classic anti-Semitism, near-total historical ignorance and reflexive sympathy for the ostensible Third World underdog, these eruptions featuring Palestinian casualties ultimately undermine support for Israel’s legitimacy and right to self-defense. In a world of such Kafkaesque ethical inversions, the depravity of Hamas begins to make sense. This is a world in which the Munich massacre is a movie and the murder of Klinghoffer is an opera — both deeply sympathetic to the killers. This is a world in which the U.N. ignores humanity’s worst war criminals while incessantly condemning Israel, a state warred upon for 66 years that nonetheless goes to extraordinary lengths to avoid harming the very innocents its enemies use as shields. It’s to the Israelis’ credit that amid all this madness they haven’t lost their moral scruples. Or their nerve. Those outside the region have the minimum obligation, therefore, to expose the madness and speak the truth. Rarely has it been so blindingly clear. Filed in Uncategorized | Tagged appeasement, media/academic/entertainment bias, Middle East peace, moral equivalence | Comments Off on The difference between Israel and Hamas. When minutely exact statistics are provided in chaotic circumstances, it suggests the statistics are garbage. When a news organization relies—without clarification—on data provided by a bureaucratic organ of a terrorist organization, there’s something wrong there, too. But let’s assume for argument’s sake that the numbers are accurate. Does this mean the Palestinians are the chief victims, and Israelis the main victimizers, in the conflict? By this dull logic we might want to rethink the moral equities of World War II, in which over one million German civilians perished at Allied hands compared with just 67,000 British and 12,000 American civilians. The real utility of the body count is that it offers reporters and commentators who cite it the chance to ascribe implicit blame to Israel while evading questions about ultimate responsibility for the killing. Questions such as: Why is Hamas hiding rockets in U.N.-run schools, as acknowledged by the U.N. itself? What does it mean that Hamas has turned Gaza’s central hospital into “a de facto headquarters,” as reported by the Washington Post? And why does Hamas keep rejecting, or violating, cease-fires agreed to by Israel? A reasonable person might conclude from this that Hamas, which started the war, wants it to continue, and that it relies on Israel’s moral scruples not to destroy civilian sites that it cynically uses for military purposes. But then there is the Palestine Effect. By this reasoning, Hamas only initiated the fighting because Israel refused to countenance the creation of a Palestinian coalition that included Hamas, and because Israel further objected to helping pay the salaries of Hamas’s civil servants in Gaza. Let’s get this one straight. Israel is culpable because (a) it won’t accept a Palestinian government that includes a terrorist organization sworn to the Jewish state’s destruction; (b) it won’t help that organization out of its financial jam; and (c) it won’t ease a quasi-blockade—jointly imposed with Egypt—on a territory whose central economic activity appears to be building rocket factories and pouring imported concrete into terrorist tunnels. This is either bald moral idiocy or thinly veiled bigotry. It mistakes effect for cause, treats self-respect as arrogance and self-defense as aggression, and makes demands of the Jewish state that would be dismissed out of hand anywhere else. To argue the Palestinian side, in this war, is to make the case for barbarism. It is to erase, in the name of humanitarianism, the moral distinctions from which the concept of humanity arises. Another report yesterday was accompanied by a single image: that of a dead child in a Gaza hospital. A second report yesterday, ostensibly about Hamas tunnel attacks on Israel, bizarrely contained not a single picture related to those attacks. The three pictures it contained presented the same one-sided narrative of Israelis as attackers, Palestinians as victims. One picture showed an IDF artillery gun firing into Gaza; a second showed Palestinian mourners at a funeral; a third showed Palestinians waiting in line for food rations. Indeed, a check of the Twitter feed of the Times’s photographer in Gaza shows not a single image that portrays Hamas in a negative light. It’s nothing but civilian victims of the IDF. Likewise, the Twitter feed of Anne Barnard, the Beirut bureau chief for the Times currently “reporting” from Gaza, is almost entirely devoted to one thing: anecdotes, pictures, and stories about civilian casualties. Perusing her feed, one would think there are simply no terrorists in Gaza who started this war, who are perpetuating it, who are intentionally attacking Israel from neighborhoods and apartment buildings and thereby guaranteeing the very civilian casualties Barnard appears so heartbroken over. Maybe all of this is an illustration of just how biased against Israel the Times has become—so biased that Times photographers and editors are simply blind to any image that doesn’t conform to their view of the war. Or maybe, in the interest of the safety and access of their journalists, the Times is complying with Hamas instructions. As reported by MEMRI, Hamas published media guidelines instructing Gazans to always refer to the dead as “innocent civilians” and to never post pictures of terrorists on social media. Hamas is currently preventing foreign journalists from leaving the Strip, in effect holding them hostage. These journalists must be terrified—and they also must know that the best way to ensure their safety is to never run afoul of the terrorists in whose hands their fates lie. A play on words, Jonah Goldberg calls the meltdowns in Iraq and Syria the Jihadi Spring. This is the antithesis of the Arab Spring, and the Sunni Islamic extremist group ISIS (Islamic State of Iraq and Syria) have wrought havoc in Syria and have now taken Mosul in Iraq, and setting their ultimate sights on Baghdad. Yesterday the city of Tal Afar was held by a U.S.-backed and trained Iraqi general. Today, it fell to ISIS. Our president, all but useless in foreign policy matters, spends his days — outside of golfing, that is — lecturing us on important matters like racist NBA franchise owners, the term “Redskins,” and why the NRA is evil. Those seldom times when foreign policy is discussed it quickly becomes confusing and contradictory. On the same day that Sec. of State John Kerry claimed that military cooperation with Iran was on the table for dealing with ISIS, the White House ruled it out. A flabbergasted Iraq, meanwhile, is asking Iran for help. How desperate is that? “Don’t do stupid [stuff]” is itself stupid [stuff] as far as foreign policy goes. Besides, it’s not even a foreign policy, it’s decision paralysis disguised as nuanced thinking. Eventually it gets boiled down to only “Don’t do.” As in nothing. Perhaps if the ISIS terrorists were advocating lower taxes, less government control and attended Tea Party rallies the president could at least sic his IRS on them. Here’s a thought. Everyone gets that the American people might not welcome “boots on the ground.” In fact, let’s scratch that off the table right now. But we’re talking about a president who by 2012, or in his first four years in office, had already used drone strikes to kill terrorists at a rate of six times what George W. Bush had authorized in eight years! At the beginning of 2014, under five years of the Obama drone program, more than 2,400 people had been killed. So this is hardly a president who is shy about using unmanned planes and Hellfire missiles to solve problems. You’ve all seen the pictures of ISIS trucks lined up in large convoys, driving to and fro while the black-uniformed, black-flag waiving extremists perform acts of atrocities so vulgar that even Al Qaeda has distanced itself. ISIS proudly posts pictures of their executions and beheadings of Iraqi soldiers, police and civilians — Another 1,700 dead recently. 1,700, and that’s a walk in the park for these guys. It begs the question, could President Obama not spare a few more drone missiles for such an easy target as a column of pickup trucks? Even if you don’t agree with the decision to invade Iraq in 2003, it cannot be denied that the government of Iraq is if nothing else an ally, and certainly more so than Libya ever was. A little support from the U.S. military drone program, one that poses zero risks to American soldiers, seems like a no brainer and a quick way to give the Iraqi government support while giving Islamic extremists something to fear and consider. The Daily Beast reported a top Kurdistan official recently saying, “Practically speaking, the country has broken apart.” At a certain point one must ask, is that the very design of the Obama Administration? He didn’t like it, didn’t agree with it, voted against it, so he’s going to do his part destroy what might have been, headless Iraqis be damned. Wow. Charles Krauthammer sums up the Bergdahl prisoner swap perfectly. He’s right, complaints about negotiating with terrorists are non-starters and off the mark from the get go, while accusations that the president broke law are ridiculous assuming you’ve ever read Article II — he’s the president, commander-in-chief, and gets a wide latitude of control regarding all things military, particularly when at war. But that’s where the defense ends and the fiasco begins. This was a giant crap sandwich, but the clowns in the White House — complete with that parroting Pamela Doll known as Susan Rice, reenacting her Benghazi embarrassment — tried to turn it into the second coming of bringing home John McCain or Scott O’Grady. One more thing before we get to Krauthammer. Have you seen the pro-Taliban tweet by Robert Bergdahl? He tweeted [since deleted], “I am still working to free all Guantanamo prisoners. God will repay for the death of every Afghan child, ameen.” Not only is it insulting of those who died trying to find his son, but it stinks of moral equivalency. Mr. Bergdahl must not have heard that common Afghans are lamenting the return of former Taliban warlords (“Release of Taliban Detainees Alarms Afghan Villagers“). Even Human Rights Watch, hardly a right-wing or pro-Gitmo group, are troubled by what they call the release of Taliban war criminals. So does Mr. Bergdahl’s tweet go for avenging the death of Afghan children at the hands of these five released detainees? Can anyone in our useless lapdog media ask that question? They should, considering that almost one in every three (29%) released detainees has returned to terrorism and violence. It’s what they know. The five released detainees are unrepentant, militant and dangerous. They’re likely to go back into the field and resume their war against local and foreign infidels, especially us. The administration pretense that we and the Qataris will monitor them is a joke. They can start planning against us tonight. And if they decide to leave Qatar tomorrow, who’s going to stop them? The administration might have tried honesty here and said: Yes, we gave away five important combatants. But that’s what you do to redeem hostages. In such exchanges, the West always gives more than it gets for the simple reason that we value individual human life more than do the barbarians with whom we deal. No shame here, merely a lamentable reality. So why does the Bergdahl deal rankle? Because of how he became captive in the first place. That’s the real issue. He appears to have deserted, perhaps even defected. Assume, however — and we will find out soon enough — that Bergdahl was not a defector. Simply wanted out — a deserter who walked or wandered away from his duty and his comrades for reasons as yet unknown. Do you bargain for a deserter? Two imperatives should guide the answer. Bergdahl remains a member of the U.S. military and therefore is (a) subject to military justice and (b) subject to the soldiers’ creed that we don’t leave anyone behind. What to do? Free him, then try him. Make the swap and then, if the evidence is as strong as it now seems, court-martial him for desertion. Good God. This is no victory. This is a defeat, a concession to a miserable reality, a dirty deal, perhaps necessary as a matter of principle but to be carried out with regret, resignation, even revulsion. The Rose Garden stunt wasn’t a messaging failure. It’s a category error. The president seems oblivious to the gravity, indeed the very nature, of what he has just done. Which is why a stunned and troubled people are asking themselves what kind of man they have twice chosen to lead them. Below is a funny but sad commentary by Mark Steyn regarding a recent Michelle Obama tweeted pic of the #bringbackourgirls Internet meme. Internet hash-tag petitions — which is what they are, really, instant mass petitions — are fine for the masses. But as a foreign policy tool it’s pure impotence. Similarly, Charles Krauthammer sees the selective outrage, adding better late than never. Two months earlier, Boko Haram had raided a Christian school and, after segregating the boys, brutally murdered 59 of them. 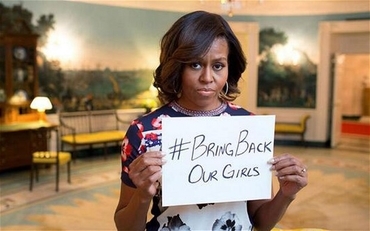 That elicited no hashtag campaign against Boko Haram. Nor was there any through the previous years of Boko Haram depredations — razing Christian churches, burning schools, killing infidels of all ages. It is hard not to have total contempt for a political culture that thinks the picture at right [above] is a useful contribution to rescuing 276 schoolgirls kidnapped by jihadist savages in Nigeria. Yet some pajama boy at the White House evidently felt getting the First Lady to pose with this week’s Hashtag of Western Impotence would reflect well upon the Administration. The horrible thing is they may be right: Michelle showed she cared – on social media! – and that’s all that matters, isn’t it? As Mr Payne notes, these days progressive “action” just requires “calling on government” to act. But it’s sobering to reflect that the urge to call on someone else to do something is now so reflexive and ingrained that even “the government” – or in this case the wife of “the government” – is now calling on someone else to do something. Boko Haram, the girls’ kidnappers, don’t strike me as social media types. Filed in Uncategorized | Tagged economics, hypocrisy | Comments Off on Oh, now Warren Buffett is for avoiding taxes.